Whether you have no knowledge of firearms or consider yourself well informed, you will learn something from Daniel R. Engel’s massive compilation of facts about how firearms work, how to shoot, what ammunition to use, and how to safely carry a concealed weapon. Although primarily about handguns, the book also covers in detail rifles and shotguns for self-defense. Topics such as recoil, velocity, barrel lengths, penetration tests, sights, safeties, shooting techniques, body armor, concealed carry holsters, self-defense insurance, and guidelines if you’re forced to fire in defense of your life are all included. Nonetheless, he separates critical fact from Hollywood fantasy and ill-informed opinion (which comes all too often from self-proclaimed gun experts). 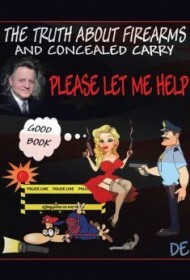 Readers who have decided to use a firearm for self-defense, and who can persevere through this book despite its narrative challenges, are likely to avoid becoming one of the all-too numerous statistics on gun mishaps and can even learn something that might save their lives.